CSS has supported the operation and maintenance of EPA's PHILIS mobile laboratory units since 2007. The PHILIS units, stationed in Edison, NJ and Castle Rock, CO, are designed to detect chemical warfare agents (CWAs) and toxic industrial chemicals (TICs). 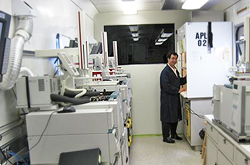 CSS chemists performed setup, calibration and maintenance of multiple GC/MS and LC/MS equipment, as well as methods development for each unit. The PHILIS units provide on-site laboratory capabilities to support EPA's Environmental Response Laboratory Network during responses to CWA attacks and Incidents of National Significance (INS), and may be mobilized to any other locations deemed fundamental to accomplishing EPA's mission. CSS provides training on the set-up, operation and general use of the PHILIS system, including the SPA trailers, the portable analytical laboratory trailers, the sample login area trailers and all the associated analytical and laboratory equipment present in the trailers or associated with their use. We provide training on mobilizing the PHILIS assets to other locations or the demonstration of PHILIS capability and assets at EPA or other agency-sponsored conferences, exercises or training events. Most recently, CSS staff members have prepared for and participated in audits for National Environmental Laboratory Accreditation Conference (NELAC) certification of the PHILIS units. CSS provides technical expertise and assistance during training exercises, in addition to developing training guides and manuals. The PHILIS units may participate in interagency exercises and trans-boundary activities in foreign countries, and may be deployed to Superfund sites to perform environmental analysis at the request of EPA Regional Offices.